"For more than four hundred years a tradition of algorithmic composition has flourished in the art of change ringing—the practice used, in the English-speaking world, to sound sets of free-swinging bells in the towers of churches and college chapels. "Syntax is to word order as melody is to note order. Peal explores the analogy of melody and syntax by applying the methods of change ringing to rows of words: poetic lines." 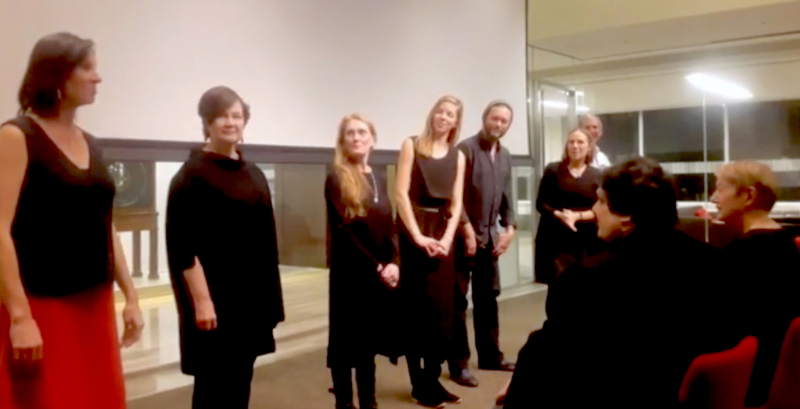 Randall Couch, author of Peal (Coracle Press, 2017), together with performers from Charlottesville-based Orchestral Maneuvers, presents an inter-genre work combining aspects of text art, algorithmic composition, and conceptualist poetry. The presentation will include an introduction to change-ringing and the book’s genesis, followed by a reading and polyvocal performance. Concrete and conceptual, structured and sensuous, in performance Peal offers the opportunity for procedural poetry to be both heard and deeply felt. Orchestral Maneuvers performers include Sandra Bain Cushman, Molly Derdeyn, Connor Douglas, Lisa Goff, Kathy Kuhlmann, Virginia Osterman, Laura Rogers, Tucker Rogers, and Thea Tupelo-Schneck, as well as Phil Walker (Charlottesville support team). Interested in learning more about Peal? We encourage you to visit the exhibition "Writers Making Books," presented in conjunction with the Pew Foundation's regional project "Whitman at 200: Art and Democracy," at Arcadia University's Spruance Art Gallery in Glenside, PA, February 28–April 21, 2019.